Have you ever wondered what actual users say about CLARIFIRE®'s impact on their business? "We were able to significantly increase our daily count of processes closed the very first day using CLARIFIRE." "The Dashboard is the key to us doing work." "CLARIFIRE allows us to hear the customer." "We now hire for attitude and train on the system." "We use to only measure complaints. Now we measure compliments." "The automated calls that launch workflow... are completely innovative." 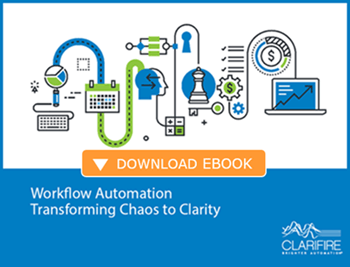 "We need to manage end to end workflow and CLARIFIRE helps us do that." Workflow is the backbone for navigating the complexities of business. Download our eBook! 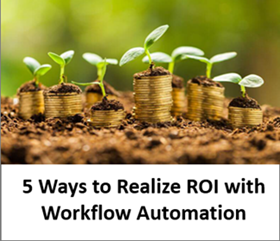 Check out our blog on 5 Ways to Realize ROI with Workflow Automation!